1) Unless you are determined to be absolutely independent and refuse to ask for assistance from anyone (and if so, more power to you! ), it’s best to have a local book your ticket for you. Theoretically you can book tickets yourself online, but it will take you a minimum of half an hour just to set up an account, and that’s if all goes well. Sometimes the setup doesn’t work, for unknown reasons. Also, the rail booking system includes many pitfalls the inexperienced railway rider could easily fall into when selecting a ticket, leading to a potentially nightmarish journey. 2) When booking online in advance, you may find that certain classes are sold out. The system doesn’t describe them as sold out, they are marked “Waiting List” followed by the number of people on the waiting list. The system will still allow you to make a booking and will charge you, but you won’t have a confirmed seat, and if there aren’t enough cancellations, you may not have a seat at all. A friend of mine had this experience, resulting in a nightmare of a travel snarl. The waiting list often has alarmingly high numbers but you may still get a seat. I bought one that up until the day before travel was oversold by 8, but I ended up getting a seat. 3) You can also buy tickets last minute at the station, but of course that depends on what’s still available. Nice guys on the Trivandrum-Varkala train (2nd class AC sleeper coach) who kindly researched for me whether this train would in fact stop at Varkala. 4) Most trains have some air-conditioned cars (yesssss!!! Something I didn’t realize until after my 3rd train ride, since most of the cars have open windows) and you have to book those specifically. They’re listed as AC cars. 5) 2nd class sleeper car is fine. I mention this because the idea of 2nd class railcar in India scared me, but it was decent. I couldn’t even tell the difference between 1st and 2nd class – neither resembled my idea of first class, but in both you get a cushioned bench to yourself which is pretty comfortable and more spacious than a seat. It’s nice to be able to stretch your legs out and lie down if you want. 6) Sleeper cars have seat numbers, and if you book in advance you’ll have an assigned booth. If you buy a ticket last minute at the station, you don’t get an assigned seat and you are supposed to get in a car of the class you bought and find an open seat. On two separate occasions I bought a last minute ticket at the station and I couldn’t figure out which car was what category, so I just picked one that had space and seemed comfortable. I’m pretty sure I was in the wrong one both times but the conductor didn’t happen to come by either time and nobody made me move. The trains do get full often so you might not always be so lucky. 7) At some stations in Kerala (it might be different in other areas of the country), sometimes but not always they write some valuable information on a whiteboard: the name and number of the train that’s coming as well as what track it’s on. They also include a diagram of the train so you can see where your car will be. This is important because these trains are looooooong! Supposedly they have a maximum of 28 coaches but they look even longer. So, you don’t want to be standing at the wrong end when your train pulls to a stop and end up sprinting a quarter mile with your luggage in tow to jump on before the train starts moving again. 8) They don’t call out the names of stations for each stop, so it’s always a good idea to make friends with your fellow passengers who are usually quite friendly and will gladly give you a heads up when your stop is approaching. And who also, if needed, can confirm whether you are actually on the right train, because sometimes the signage can be quite unclear. The wifi and cell signal on trains can be quite spotty so you're usually but not always able to check where you are on GoogleMaps. 9) Some of the trains have Ladies Only cars – these are a nice and very cheap option. I took this from Mararikulam to Kollam (a 2 hour, 100 kilometer journey) and the ticket cost me about 40 cents. Some lovely Indian ladies who were English teachers and spoke perfect English sat next to me and very kindly helped me get off at the right stop. While we’re on the subject of trains, just a quick note about the metro in Delhi: it’s clean, modern, efficient and super cheap. Depending on how far you're going, the ticket will cost you around thirty cents. They even have a great earth-friendly system that uses reuasable round plastic coins instead of disposable paper tickets. An amazing option to move around the city while avoiding Delhi heat and traffic. You can find a route map here: http://www.delhimetrorail.com/zoom-map.jpg . 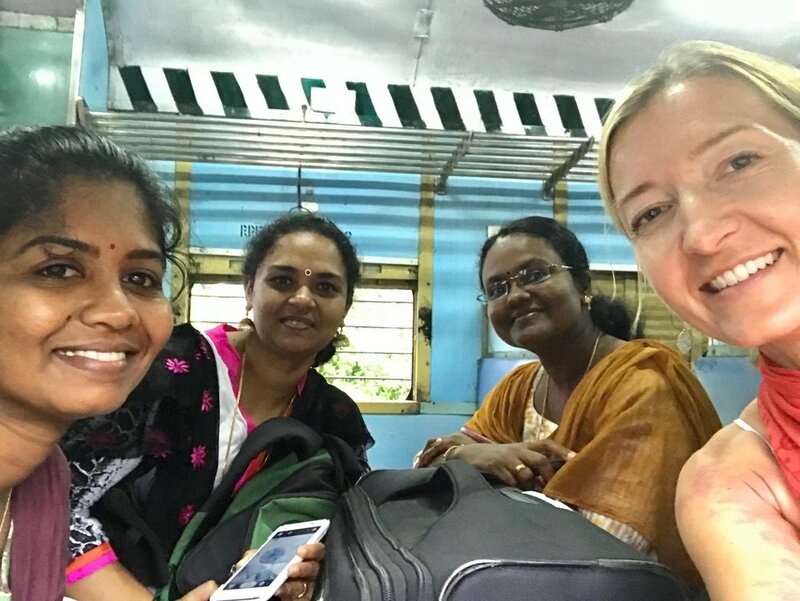 These were just a few highlights which I hope were useful – if you’re looking for a more thorough understanding of the Indian rail system, this is a great page: https://www.seat61.com/India.htm#Travel tips.